Half Round Wire There are 11 products. 18 Gauge Half Round Copper wire with a clear anti-tarnish coating. Sold as a 6.4 metre piece. 18 Gauge Half Round Copper wire that has been plated with fine silver and then finished with a gold colour protective coating. Sold as a 3.5 metre piece, this wire has a clear anti-tarnish coating. 18 Gauge Half Round Copper wire that has been plated with fine silver and then finished with ParaWire's exclusive enamel coating in a Rose Gold colour. Sold as a 3.5 metre piece, this wire has a clear anti-tarnish coating. 18 Gauge Half Round Copper wire that has been plated with fine silver and then finished with a clear anti-tarnish coating. Sold as a 3.5 metre piece. 21 Gauge Half Round Copper wire with a clear anti-tarnish coating. Sold as a 6.4 metre piece. 21 Gauge Half Round Copper wire that has been plated with fine silver and then finished with a gold colour protective coating. Sold as a 3.5 metre piece, this wire has a clear anti-tarnish coating. 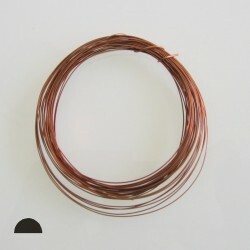 21 Gauge Half Round Natural Copper wire. This is raw copper and will tarnish over time. Sold as a 6.4 metre piece.